Cage-free housing is more spacious for hens, but the extra room comes with added risk of collisions and broken bones. Many cage-free hens are developing breast or "keel" bone fractures when they misjudge the distance between perches and platforms and collide with other birds and features in their environment. "With improved navigational skills, hens may be less likely to collide with other birds on route to food and water," said Maja M. Makagon, an assistant professor with the UC Davis Department of Animal Science who is leading a team of collaborators from UC Davis, Iowa State University, the University of Bristol in England and the University of Bern in Switzerland. Laying hens have experienced keel-bone fractures for decades, but the incidence is rising as more flocks are raised in open, multi-tier systems. 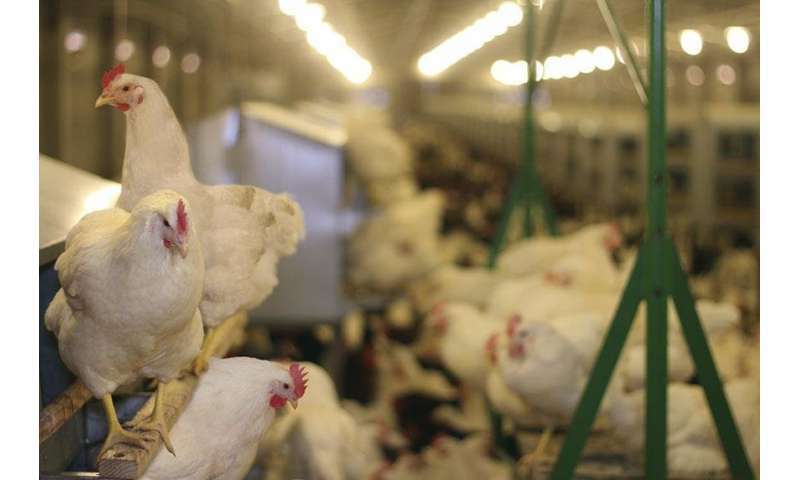 "Cage-free" can mean different things on different farms, but typically cage-free birds flap around in large, vertical, enclosed spaces to reach food, perches and nesting areas. Today's hens are not especially adept at flying, and sometimes their landings fail. "We hypothesize that if you expose birds to environments that are vertical in nature, two things will happen: keel bones will develop stronger and birds will be better at navigating space," she said. Then, researchers will conduct similar tests on a small scale at UC Davis. They will rear chicks in pens with different levels of vertical complexity and evaluate how that affects keel-bone development and a bird's cognitive and navigational skills. Happier, healthier, more productive hens on omega-3?